The box art for the Italian Thorium Orbiter. 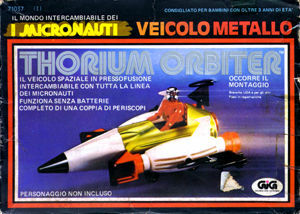 Despite appearances, the Italian Thorium Orbiter is the same as the regular Mego version. Still one of the nicer of the small vehicles, the Thorium Orbiter consists of a metal body, plastic nosecone and side pods, and a set of mirrors on the ends of the pods! The original Microman version of this ship is known as the Jet Mirror for obvious reasons.